In science courses, measures of self-efficacy have been positively correlated with increased student persistence in the face of obstacles, improved academic performance, as well as greater likelihood of pursuing science degrees. Certain classroom interactions may contribute to self-efficacy through one of four recognized sources, two of which--verbal persuasion and vicarious learning--are highly social in nature. 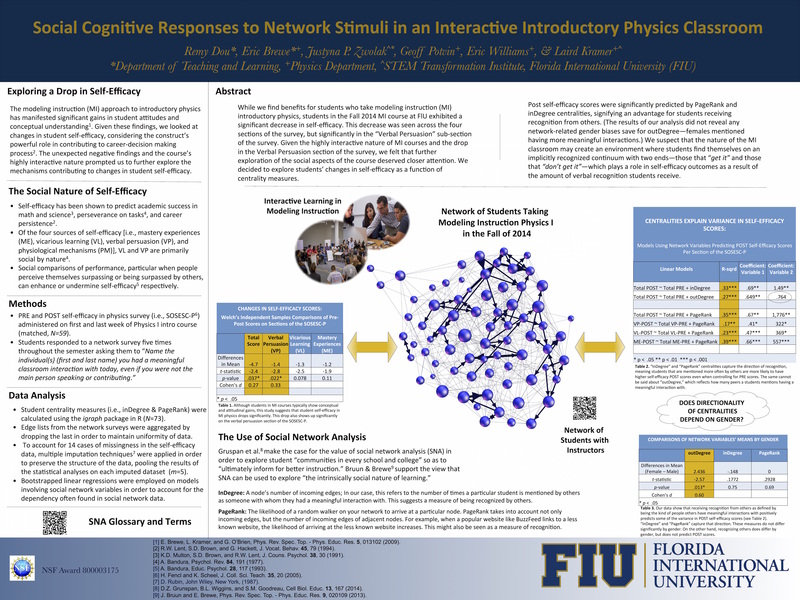 In this study, we looked for relationships between academic classroom interactions and student self-efficacy in a 73-student introductory Modeling Instruction physics course at Florida International University. Social network analysis (SNA) was used to calculate various centrality measures--proxies for students' position in the academic social network of the classroom. Multiple linear regression models revealed the predictive power of network centrality on students' self-efficacy as measured by the Sources of Self-Efficacy in Science Courses-Physics survey. The results of the analyses provide new insight into the dynamic interactions occurring in active-learning physics courses.